Dogs are good for the body and soul. KALI LETS OUT a loud groan, makes a resounding thump, then gives Kyle a sloppy wet kiss on the cheek. Nearby, a librarian looks up from her desk and … smiles? This isn’t behavior appropriate for a library’s quiet, sacred space. But Kali isn’t a rowdy, lusty patron. This sleek black dog is doing important work: helping new readers like Kyle gain literary confidence and proficiency. 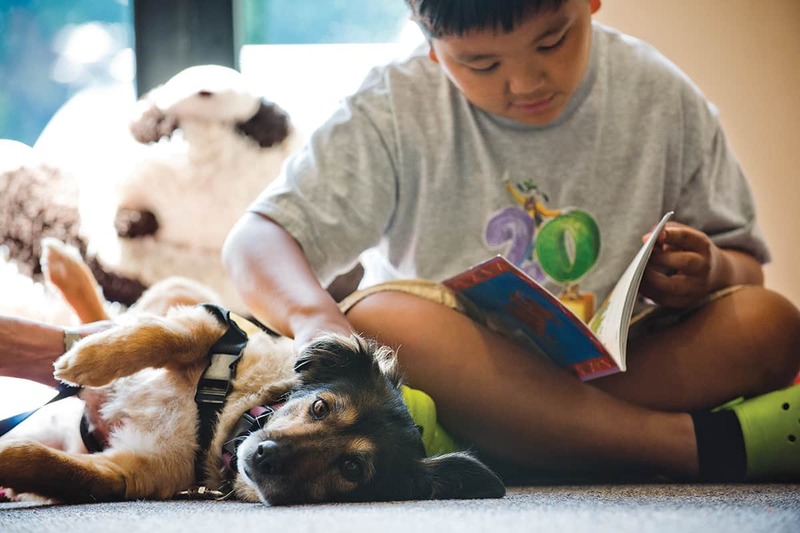 According to a study by the University of California, Davis, just ten weeks of reading to Rover boosted children’s reading skills by 12 percent versus the flatlined performance of their pupless classmates. Kyle giggles and squiggles in his chair. Currently Kali’s handler—although at home she’s the boss—I coax her back into a seated position. Kyle gives the dog a smirk, then turns back to his book about colors. Some of the stiff cardboard pages he bypasses in a quick flip; others he thoughtfully shows to Kali, explaining each drawing. Often, Kyle pauses, mystified by the letters he sees scrambled on the page. Sometimes he’ll try to sound his way through, and other times he’ll simply invent his own words—some coherent, some not; most spoken in a loud whisper. Speech therapists have found that people who stutter can often communicate fluidly when speaking to animals. Kali is a nonjudgmental, patient listener. It doesn’t matter what Kyle is reading; what matters is that Kyle is reading. According to the Journal of Physical Activity and Health, dog owners are more likely to reach their fitness goals than those without a dog. A Michigan State University study found an increase in physical activity by 69 percent, while researchers at the University of Missouri measured a 28 percent increase in walking speed. 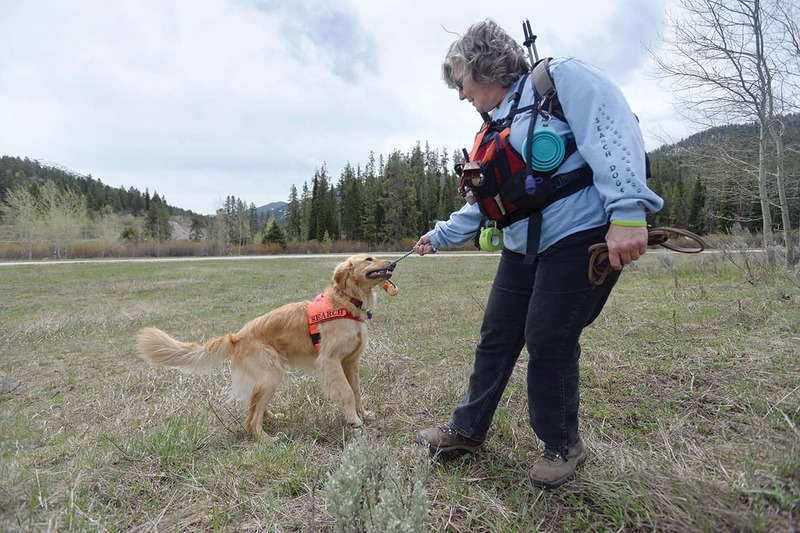 The Read to Rover program, organized by the nonprofit Teton County Pet Partners, is just one example of the benefits—physical and mental—of the cross-species connection. Scientists and medical professionals are only beginning to explore these unique relationships and look into ways to capitalize on the health advantages from the kind of prescription most people would deem far preferable to a pill: time with a dog. THE HEART MELT your dog’s doey eyes can elicit isn’t just a ploy for a belly scratch. It’s the result of 18,000 years of relational evolution between canines and humans. True, some of this dogged devotion is food-based (an interchange that’s occurred for thousands of years), and a dog’s unique ability to hold an extended gaze with humans helps explain their initial domestication. But scientists are increasingly discovering that a dog’s ranking as “man’s best friend” is rooted in complex, mutually beneficial neurochemical reactions. Oxytocin, the same feel-good hormone a mother releases while looking into her child’s eyes, is also unleashed when canine and human eyes lock. Oxytocin also impacts social memory and facial recognition, other noteworthy factors in social bonding. According to a Japanese study, dogs can smell the oxytocin, creating a feedback loop of feel-good sensations for dogs and humans alike. Other important neurochemical reactions that occur with canine cuddling include an increase in other warm and fuzzy hormones, like beta-endorphin, which helps with euphoria and pain relief; parenting bond-booster prolactin; beta-phenylethylamine, which correlates to finding a romantic partner; and the pleasure stimulant dopamine. Other benefits of pet ownership read like a holistic health wish list: lowering of blood pressure, heart, and respiratory rates; a reduction in the production of harmful stress hormones; and an increase in the creation of natural painkillers and antidepressants. Of course, owning a dog typically translates into an increase in exercise. A Canadian study found that dog owners walk nearly double the distances of non-dog owners. According to the Journal of Physical Activity and Health, pup parents are more likely to reach their fitness goals than those without a dog. A Michigan State University study found an increase in physical activity by 69 percent, while researchers at the University of Missouri measured a 28 percent increase in walking speed. A 75 percent reduction in the likelihood of developing type 2 diabetes, a decreased risk of childhood obesity, fewer annual doctor visits than dogless counterparts—the studies in support of the dog-loving life go on and on, to the extent that Midland National Life Insurance Company factors into their rates whether or not clients older than seventy-five own a dog. It’s also possible that when a human does go to a medical professional, he might run into a dog. Mental health professionals are increasingly integrating dogs like Darwin and Toby of the Jackson Hole Community Counseling Center into their practices for conditions like anxiety, depression, and PTSD. 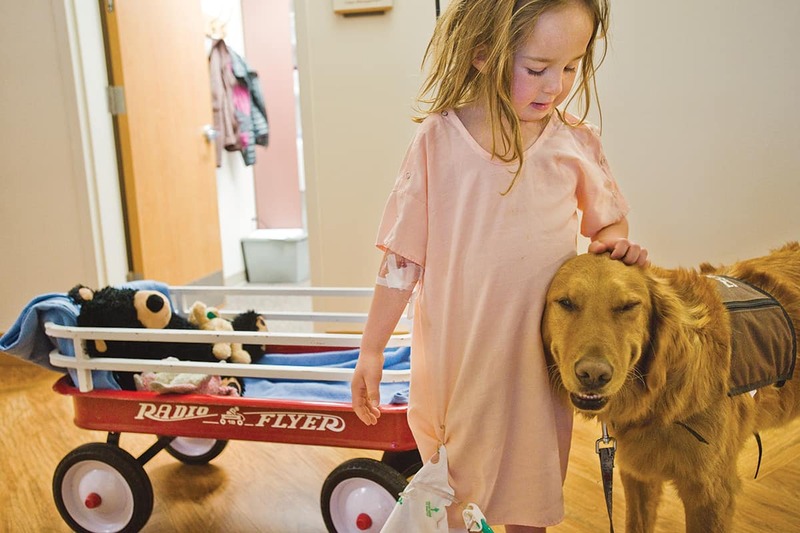 Physical and occupational therapists can create more motivating and engaging activities for patients by incorporating a dog into therapies. For example: Brushing a dog can improve hand-eye coordination and muscle control. 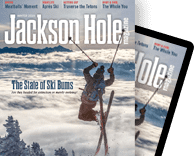 AROUND THE VALLEY you may catch a glimpse of Jackson Hole Mountain Resort’s ski patrol canines, dogs that are rigorously trained to aid in the search for avalanche victims. There is also a cadre of similarly skilled dogs working on local search and rescue teams specializing in water, cadaver, and live searches. But the lifesaving services a dog’s nose can provide go far beyond search and rescue applications. Today, doctors are putting dogs’ keen sense of smell to good use to sniff out conditions like cancer, narcolepsy, migraines, low blood sugar, allergens, and seizures. Former Lander, Wyoming, resident Sylvi Schneider has a yellow Lab named Simba from Diabetic Alert Dogs of America. Sylvi, age eight, has a form of glycogen storage disease that leaves her body unable to store sugar. This means Sylvi has extremely limited energy reserves and is susceptible to chronic hypoglycemia. Simba can sniff out plummeting blood sugar, alerting Sylvi to dangerous levels by pawing at her or by alerting her parents. Eventually, with Simba’s help, Sylvi may be able to wean off the nearly one dozen fingersticks she must perform daily. The studies in support of the physical and mental benefits of dog ownership are so powerful that Midland National Life Insurance Company factors into their rates whether or not clients older than seventy-five own a dog. It’s not just young kids who benefit from puppy love. Some schools, like Chapman University in California, recruit dogs for petting sessions during final exams as a way for students to de-stress. At American University’s Kogod School of Business, students have started practicing their speeches and presentations on dogs. Who knows—someday Kyle, the boy from Read to Rover, could practice his pitch for a life-changing product or a multimillion-dollar transaction on a long-eared, squirrel-obsessed listener similar to Kali. While keeping your eyes peeled for moose, elk, and bald eagles, don’t forget to add this equally important animal to the tick list: the adoptallamus muttcommonalus. Sometimes black in color with patches of white, this is a diverse species but identifiable by orange markings with the words “ADOPT ME” emblazoned on its sides.